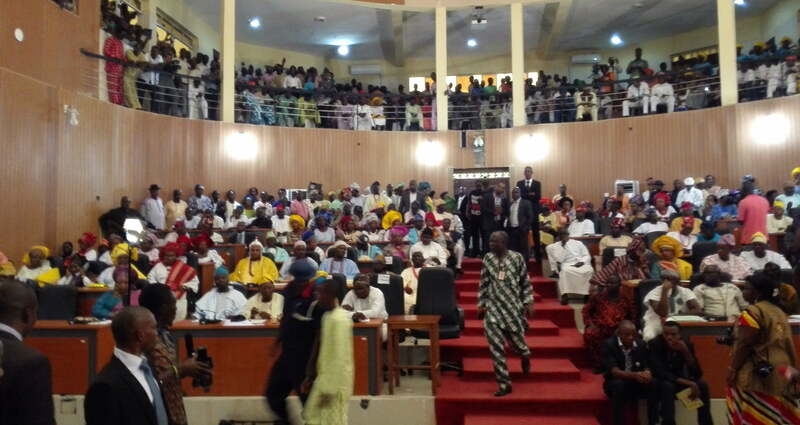 There seems to be no end in sight to the crisis rocking the Ondo State House of Assembly any time soon. Last Friday, 18 out of 26 members of the house who purportedly signed the impeachment notice of the two principal officers of the stateâ€™s hallowed chamber, sacked the erstwhile speaker, Bamidele Oleyelogun and his deputy, Iroju Ogundeji, over allegations of financial misconduct and incompetency. Meanwhile, two out of the 18 lawmakers involved in the impeachment saga have distanced themselves from the act, alleging that their signatures were forged, while the group led by Olamide George, the new speaker, insisted that the duo of Sunday Olajide and Oluyede actively took part in the entire process of the impeachment. However, it was reliably gathered that the amendment bill for the re-ordering of the 2018 budget sent to the house by the state governor, Oluwarotimi Akeredolu, was the beginning of the current crisis rocking the house. A source among the legislators told DAILY POST that it is a â€œnormal ritualâ€ that when financial or appropriation bills are sent to the state legislature for approval, financial tips for members must accompany such, particularly when express approval is needed. The source, who preferred anonymity, further revealed that when the issue of the re-ordered budget came up, N36 million was requested which the Governor turned down. â€œHe (governor) requested speedy passage of the re-ordered budget. But itâ€™s a normal procedure to back it up with our benefits as well. â€œDo you know that under this administration, we virtually gained nothing, nothing whatsoever. â€œMost of us are not coming back next year because some of us in the same ruling APC were not given the return ticket. â€œWhen we requested that Aketi should give N36 million which 26 of us agreed to, he (the governor) refused. â€œIt was subsequently agreed to, that the bill would be delayed, but to our surprise, those who were given return tickets were threatened by the Governor and they backed out from the initial plan including Oleyelogun and Iroju. Also when DAILY POST made further inquiry, another source within the Governorâ€™s circle confirmed that N36 million was demanded by the lawmakers which the Governor did not succumbed to. â€œYes, itâ€™s true they demanded N36 million when the amendment bill was sent to the house. On Thursday, the Majority Leader of the house, Olugbenga Araoyinbo, who is in the camp of Olamide George, had raised an alarm that the bill for the re-ordering of the budget is unconstitutional. Araoyinbo posited that the re-ordered budget, which was designed to allegedly cover up some shady dealings of Gov Akeredolu, was one of the basis for impeaching the erstwhile Speaker, Bamidele Oleyelogun and his deputy, Iroju Ogundeji. The statement issued on Thursday partly reads, â€œIt has come to our attention that the impeached speaker of the Ondo State House of Assembly will be passing what is unconstitutionally known as a Re-Ordered Budget today. â€œWe wish to state that the request for the passage of this Bill is one of the major reasons why we chose to remove and suspend the former leadership of the House on Friday, 9th November, 2018.
â€œRt Hon Oleyeloogun had informed us that the Governor was desirous of passing the bill into law as quickly as possible under a procedure unknown to our Standing Rules, indeed, unknown to any known Law of our State or Nigeria. â€œBy this Bill, the Government seeks to cover the many shady and unappropriated approvals and spendings which are in excess of what is authorized by the Budget,â€ the statement read. Also on Thursday, nine out of the 26 members of the house loyal to the Governor approved the bill for the re-ordered budget which was to the tune of over N14 billion.